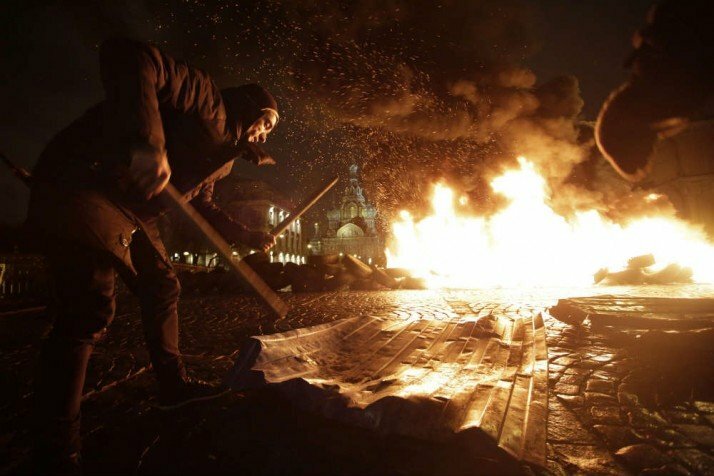 Russian performance artist Pyotr Pavlensky has been charged with vandalism for burning tyres near the Church of the Saviour on Blood in St Petersburg last year, for which he and several others were first arrested on charges of petty hooliganism in February 2014. The performance entitled Freedom, which also involved the artist and two others waving Ukrainian flags and drumming on a sheet of metal with sticks, was planned in solidarity with the anti-government protesters in Ukraine, with the tyres intended to echo the barricades set up by protesters in Maidan. Following the performance and consecutive arrest, the artist was fined 10,000 rubles ($193) but a separate criminal case was opened against him soon after. Pavlensky is known for a number of reactionary and controversial performances. Save for Freedom, the performances have been increasingly self-mutilating in nature over the last three years, with the artist having sewed up his mouth, wrapped himself naked in barbed wire, nailed his scrotum to Red Square and even cut off one of his earlobes in public.